Fat Tuesday now has some competition! That’s right, it’s the know-it-all, goody two shoes older sister, Mindful Monday. I am going to try to post things that are healthy, natural and/or about being mindful in the way we care for ourselves. I thought it would be a great way to kick the week off and give ourselves the healthy boost we may need after a weekend of debauchery! In the spirit of my current health goals, I have been trying to plan better with my food. 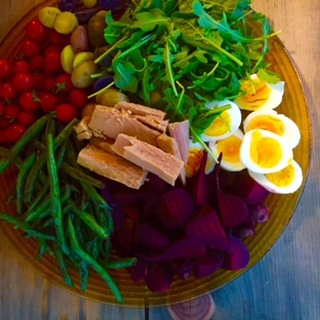 I’ve always found the Nicoise Salad (pronounced nee-swahz) to be beautiful. I love how everything is separate. Perfect blocks of color, one melding into the next like a beautiful abstract painting. I also enjoy the idea that you can put this impressive salad out at a luncheon and people can choose which parts they want. If you want only beets and tomatoes, no problem! You don’t care for eggs? No big, just pass them by! It’s a salad for everyone I tell you! Vegetables! Seriously, anything goes. Traditional items include, green beans (Which I sautéed, because that’s how I enjoy them most), tomatoes, cucumbers, boiled eggs, potatoes cut into pieces and boiled until fork tender (don’t forget to generously salt your water! ), tuna, anchovies, greens such as any head lettuce or spinach etc. I used a mix of baby spinach and arugula. Beets aren’t usually in the mix, but I LOVE them so, I added them! You can use canned tuna, but buy the best quality you can afford. I bought some in a jar at the farmers market and it’s exceptional. It was kinda pricey at seven bucks but for a special occasion, it would be justifiable. Also, I plan to split this salad up and have it for lunch all week so, it’s not too bad when you think of it like that! Anchovies are one of the traditional ingredients. I don’t care for them as they are straight out of the can, but man… if you sauté them in a little olive oil, they basically liquify and take on a beautiful almost nutty flavor that is not the slightest bit fishy. So, that’s how I made my dressing. Take one 2oz can of anchovies and sauté the whole thing with about 1/8 cup olive oil until the anchovies are melted. Remove from heat and let cool. Add 1/4 cup balsamic vinegar, 1/8 cup olive oil, 2 Tbsp. dijon mustard and 1 Tbsp. honey to a mason jar. Pour the oil and the sautéed anchovy bits into the jar as well, and shake vigorously until combined. You can either dress the salad all at once which is the traditional way or you can set the dressing out and allow people to dress their salads themselves. 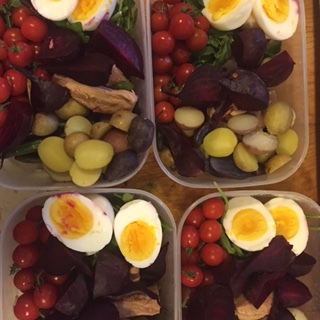 I have packed this salad up into five servings and will be taking it as my lunch this week… thankfully, there’s enough diversity in it that it will keep me satisfied all week! I hope you have a wonderful Monday and that you do something good for yourself. Take a walk, drink extra water, take a break from work and just breathe… Meditate, stretch etc. Be good to you today. Previous Post Another Swearing Mom Givaway!